The Bandwagon Effect is a psychological phenomenon where the likelihood of adopting an idea, belief, product, trend or behaviour is directly related to the uptake (or perceived uptake) among others. As more people take up something others jump on the bandwagon. The bandwagon effect is a types of copying that involves social influence. Our herd instinct is a powerful driver of behaviour. 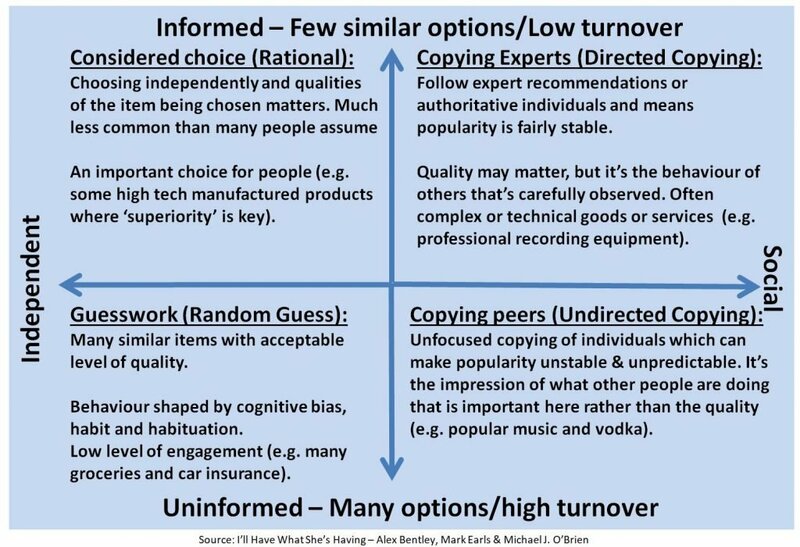 Mark Earls and his co-authors in ‘I’ll have what she’s having‘ identified four decision styles that dominate most markets, two of which are heavily influenced by social influence. Directed copying is prominent where there are relatively few similar options and people rely on authoritative individuals to follow. Undirected copying occurs in markets where there are too many choices and people to copy directly. People tend to follow the most popular choice and often with little conscious thought. This is most similar to the bandwagon effect as people copy without much, if any, conscious thought. People also have a tendency to copy the behaviour or beliefs of others because they prefer to conform as they wish to fit into the group’s norms or because individuals learn from others (e.g. when experiencing a situation for the first time). Mark Earls, author of Herd, argues that our ability to copy the behaviour and ideas of others has allowed the human race to pass valuable information onto future generations and is one of the key reasons for the success of the human race. The use of the phrase “jump on the bandwagon” originated from American politics in 1848 when Dan Rice, a well-known circus clown, used a bandwagon and the accompanying music to grab attention for his political campaign. As his campaign became more popular other politicians attempted to get a seat on the bandwagon as they hoped to become associated with his success. People will naturally be drawn to a popular and busy restaurant and avoid one that is empty. The same is true for a website. Use evidence of social proof to engage and convince your visitors that your site is trusted by lots of customers. Examples of social proof include celebrity endorsements, testimonials, logos, customer ratings and reviews, social media likes or followers and number of customers. The bandwagon effect can be a powerful influence on visitor behaviour. Ensure you effectively use evidence of social proof for both new and existing customers at key points in the customer journey. However, try and test the effectiveness of social proof on conversion because the location and implementation of social validation can have a big impact on its success. See also the post ‘The bandwagon effect and influencer marketing‘ which explore whether the bandwagon effect suggests influencer marketing is largely a scam. Herd instinct – Are most purchase decisions the result of social influence? Herd instinct – What makes social networks tick?